Xplorer W25 is one of the three Android devices Symphony launched back in June 2012. I already wrote reviews on two other devices, W10 and W50. It would be helpful if you read those two before deciding anything about Symphony Xplorer W25. W25 is the middle point of these three Android smartphones. It has most of the features of Xplorer W50 except GPS and all the features of Xplorer W10 has. But interestingly it has something that W50 hasn't! Xplorer W25 has a 5MP camera that is capable of shooting 1080p HD video. There is also a front-facing camera available for making HD calls. You can make free video call with Skype pre-installed. Symphony Xplorer W25 has also a larger battery of 1420 mAh. It has 3.5″ TFT Capacitive Full Touch Full touch display, 800MHz CPU and 32GB memory support. You can get 4GB card free with every new Xplorer W25. 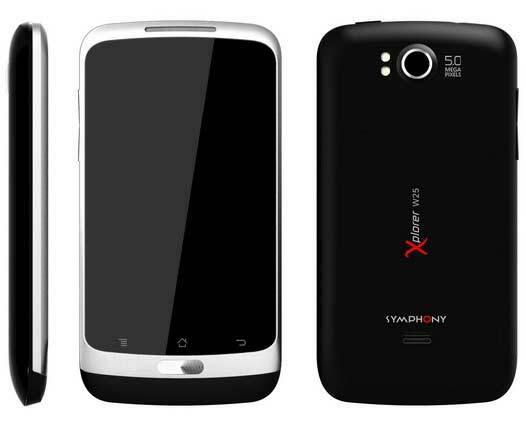 Price of Symphony Xplorer W25 is almost 9,490 taka (around $115). There are many reasons to buy this devices instead of W10. And below 10,000 taka range there's nothing in the market is better than this.